This is one of my favorite painting locations in the Catskills. You can sit on the rocks for hours and hear nothing but rushing water. The water is crystal clear, and so transparent that the pool looks a lot shallower than it really is! This painting was done with a lot of transparent pigments, a few semi-transparent, a couple of opaque pigments, and a little help from artist extraordinaire, David Dunlop. As plein air season gets underway, I’ll have to see if I can cart enough extra tubes with me to keep a transparent palette for at least part of the process. You can see how it really makes the painting glow from within. The huge, bright full moon last night received a lot of publicity! Apparently this was the largest and brightest the moon will appear for the next 19 years. They said on the news that it was approximately 14% larger and 30% brighter than usual! We had a totally clear sky here last night, so my husband and I went across the field to the lakeshore to take pictures. 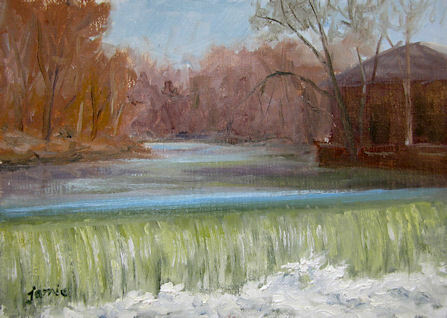 I brought my little pochade box along and did this small oil painting. There was a gentle breeze over the lake, scattering the reflections as they ran across the surface. If you haven’t already done so, be sure to check out my new site where I am posting my sketches! 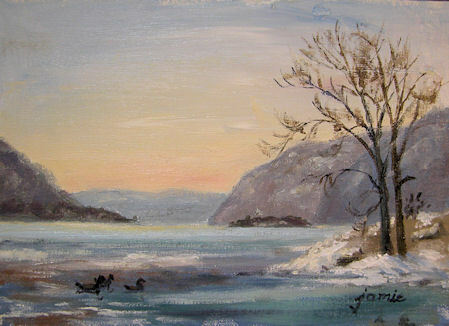 It’s called Hudson Valley Sketches (http://hudsonvalleysketches.blogspot.com). I’m no longer posting them here, so be sure to subscribe over there on the new site if you’d like to receive them in your email box or through your newsreader. It felt so wonderful today to have sun and warm temperatures! 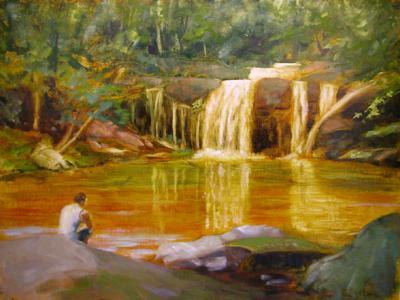 I headed over to Beacon to test drive my new SunEden easel setup at Tioronda Falls, in Madam Brett Park. That’s Mount Beacon in the painting. This is Fishkill Creek, very near where it empties out into the Hudson River. The falls were absolutely exquisite with all the recent rain we’ve had, and the SunEden performed quite well. It certainly doesn’t have all the bells and whistles of my Soltek, but it only weighs three and a half pounds, and can support a large canvas! It has a shelf to set down a palette (or you can use the shelf itself as a palette) and a box that clamps on to hold all my paints and brushes. It will be great for those out-of-the-way painting locations that aren’t so close to the car. Everything fits in a backpack and it is light, light, light! I loved painting this scene. Definitely going back soon! There is a huge amount of water in Fishkill Creek these days, following the heavy rains we’ve had here in the east, combined with the snow melt. 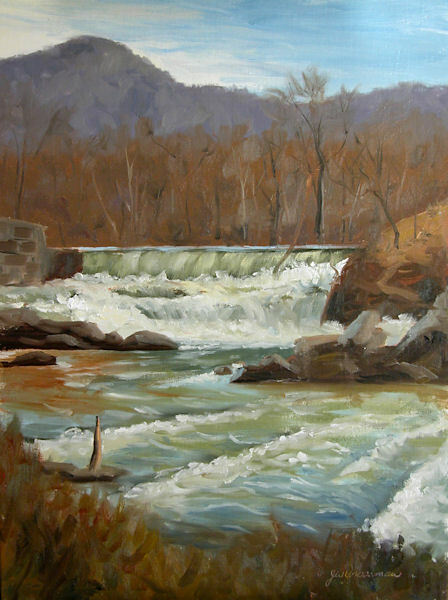 Beacon Falls is located just a couple of miles before the creek empties out into the Hudson River. There’s so much water that it’s traveling along a side spillway, and you can’t even see rock where it’s cascading over the falls. I paint a lot of waterfalls and they usually don’t give me much trouble, but I have to say that this scene presented me with a real struggle! I’m going to try to get back there to do a couple more with different compositions and in different sizes. It’s a fabulous location, and I just love a good challenge! 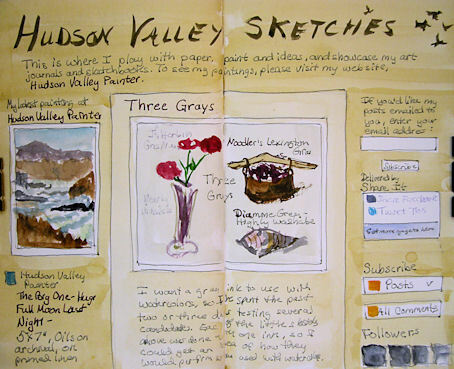 If you haven’t been over to my new site for my sketches at http://hudsonvalleysketches.blogspot.com, please go take a look! For those of you who are subscribed to receive my paintings in your email, you can also subscribe over there if you’d like to continue to receive my sketches in your email. 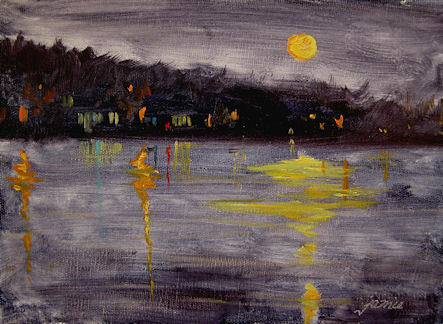 You won’t be getting any more mail than you do already — just when I do an oil painting it will come from the Hudson Valley Painter address, and when I do a sketch it will come from the Hudson Valley Sketches address. Psssst…..Would you like to have a sneak peek at my new blog for my art journals, sketches, ideas, and experiments with materials? It’s over here! I’ll be making an official announcement in a few days. I still need to do a little housekeeping at the new site. Let me know how you like it if you pop over there! Comments and suggestions welcomed! All of my paintings in progress and completed works for sale will continue to be posted here at the Hudson Valley Painter site. I did a few tweaks on this one and also added the ducks. They didn’t understand why they were in the sketch and didn’t make it into the painting! 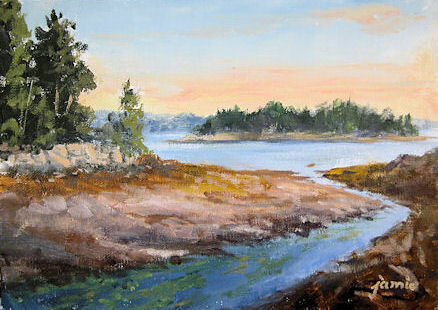 This is the painting I started yesterday on location at the Newburgh waterfront. Cold, cold, cold! I’m hoping for at least one warmer day next week! The island is Bannerman Island, home to some amazing castle ruins.